And so Gareth Barry joins the sorry ranks of British football traitors, along with all the other Judas Iscariots who had the nerve to leave one football club to join a different football club. And he only gave them 11 years of honest graft -Â what a money-grabbing weasel. Honestly, to brand Barry a traitor and Judas is absurd and laughable. 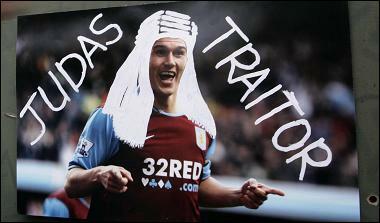 He’s been a terrific servant to Villa, a fact I’m sure the majority of the club’s fans recognise. Anyone who boos him, for example when he comes to Villa Park next season wearing a Man City away shirt, is officially an idiot. He is a judas, to quote him he said ‘I would never dream of leaving this great club if it were in the Champions League, all I want is to play Champions League football’. Has he left for a club in the Champions League? No. He’s left to a side with no European football what so ever, so much for the ambition Gareth, sure the 110k a week had absolutely nothing to do with the move. Why should the fans stand by him and say thank you? He lied to us, if he wanted a new challenge (more money basically) he should have said so. as i villa fan i can say that i do feel he went for the dosh and it will be proven he made the wrong choice he would have to live with that when he realises money isnt everything and for villa in MON WE TRUST the only way is up and to go as far as slag barry off and call him a judas is to forget the service he has gave us i will allways be a barry fan and i dont think he deserves to get slagged off its been an honour to have him play for us and this i will not forget. if he stayed he would of been a legandary villan now he will not have such an honourable title. I’m “stupid” if i boo a player who has left my club for more money? Don’t try and pretend like you understand. You clearly don’t. I agree with you, Ollie – fans are much too fickle nowadays and I often feel as if they just want trouble to happen so they can moan about it. its not like he went to stoke or anything….City is an up and coming team that is building itself for champions league…i think it was a move for money but also a move to a place that is at least trying to get better…. Fair enuf last year Gareth Barry did say he wanted to play champions league football, but don’t forget its a year later now and wen he did say that man city didn’t have our current owner, fair enuf i no city are behind the top 4 but wif our shocking away record this year let us down, if we would of had 5 or 6 more away wins we wud of finished 5th, it goes to show were not really that far behind villa and everton now, even though they dont spend that much due to they dont have the financial muscle to compete wif city, chelsea and arsenal. Liverpool and United don’t really pay that much anymore but chelsea will stop as they are heavily in debt and so are United and Liverpool owners shud be looking to sell soon. Man city will be the next team to break the top 4 but give it a season or 2. I agree with you, Liverpool and United don’t really pay that much anymore but chelsea will stop as they are heavily in debt and so are United and Liverpool owners shud be looking to sell soon. time to keep up with life.